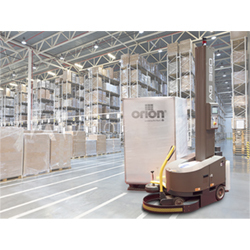 Mobile battery powered stretch wrappers are ideal for smaller warehouses that do not have the space for a rotary, or turntable stretch wrapper. The stretch wrapper can be driven to the load's location, or the load can be brought to the wrapper, allowing for the wrapper to be stored out of the way when it is not in use. A spring loaded "follow" wheel, guides the stretch wrapper around the load allowing for any size load above 24"W x 24"L to be wrapped efficiently up to a 95" height. Adjustable film pre-stretch and tension adds the versatility to ensure that all loads are wrapped securely. High capacity batteries, battery level meter, and Orion's exclusive "PowerSave" alert assures that you always have enough power to get back to a charging station. High Capacity Pallet Truck - 8000 lb. cap., 42" x 21"
Robotic Machine Tool Tending System - Automated Load/Unload, 26-1/4 lb. Payload Cap.